The Great Public Land Heist Has Begun – Are We Part Of It? Call me a conspiracy theorist – if you must – but a lot of stories have been hitting my news feed lately related to our favorite little patch of Northern Nevada that surely can’t all be unrelated. First we had the announcement of a zoning change around Gerlach, that seemed to enable the Temporary Autonomous Zone concept so favored by Larry Harvey and Peter Lamborn Wilson, aka Hakim Bey. That seemed possibly related to Billionaire Burner Larry Page’s BMOrg-endorsed vision to have all kinds of new testing grounds for Google. Not just a TAZ – also a PAZ and a SPAZ (Permanent and Semi-Permanent). Next, the town of Empire – a “quasi-ghost town in Burning Man’s back yard”, with its abandoned Gypsum mine and potential associated site contamination issues – was sold for $11.38 million. Next, we heard that BMOrg have created their own commercial airline, with planes carrying up to 30 passengers at a time. Burner Express Air is imagined to be carrying 2500 passengers per day in and out of Burning Man. Assuming that they only fly passengers in daylight hours, and every flight is full, that’s a minimum of 84 flights per day. Assuming planes start just after sunrise and stop just before sunset, that’s 12 hours a day – or one new planeload every 8 minutes. That’s their vision. $995 per person for a round-trip flight from Oakland, $495 from Reno. A couple of million dollars per day. Fossil fuel and noise pollution be damned! No spectators be damned! Like most of the aviation world, the flights will be subcontracted out to other operators. Prime contractor Advantage Flight Solutions are hiring 50 new employees to cope with the anticipated load – which sounds like a lot for a week, but more realistic for something that is anticipated to be year-round. Also in the area just recently, a long-standing case between Burners and a powerful local land-owner (whose $7 million boat, the biggest one on Lake Tahoe, mysteriously sunk at the dock) was finally settled. The court ruled that the abandoned art car, which had not been to Burning Man in at least 4 years and was in a state of disrepair, was not a valuable piece of art work worth $1 million. The Burners lost and had to pay the other side’s legal costs: about $50k. 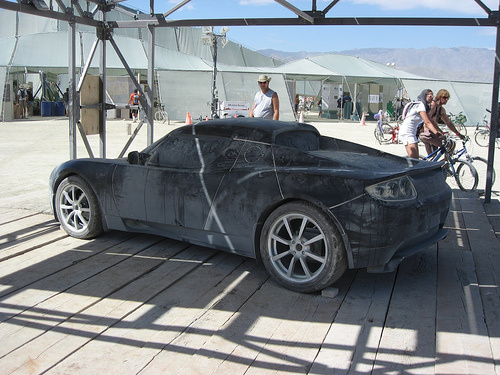 Remember this Burning Man founder’s claim that it’s because of them that Elon Musk and Bunny Ranch owner Dennis Hof built their Gigafactory in Reno, in one of the world’s biggest free trade zones. He recently got a tour of the Gigafactory with Reno Mayor Hillary Schieve and Councilman David Bobzien. Apple also just announced plans to build a $1 billion data center in the Reno free trade zone. Is there some Billionaire Burner version of Atlas Shrugged going on, Galt’s Goodell’s Gulch in the world’s hottest new tax haven? A utopian occult colony? A Monte Verita or Woodstock for the 21st Century? Or just “Esalen in the Desert”? Whichever way you look at it, that’s a helluva lot of dots. I see connections between all of them. Others are pointing some of the dot-connections out too, including Burning Man Founders and the first-ever full time Burning Man beat reporter. YMMV; maybe we’re all wrong. Still, there are a few more dots to come yet in this post. It’s not just about timber. This sets the precedent for wilderness being sold to developers. Hillary Clinton has been accused of cashing in on this, as has Harry Reid. Donald Trump is opposed to it. Why is private ownership of vast tracts of land you currently own bad? Well, it’s historically been demonstrated to reduce public access, and moves the land out of any unified, managed or regulated conservation program. Yes, there is a significant financial gain to be had by selling these lands, but that’s a one-off instance of profit from lands that currently contribute massively to local, state, and the national economy. The outdoor recreation industry alone, which relies on land access to exist, employs 6.1 million Americans and contributes $650 billion to the economy annually. The land where you and I currently go to camp, climb, cycle, hike, hunt, fish, and paddle is under threat. Federal lands, might get handed to the States and sold off to raise money? Hmmm, wonder if there are any possible connections between BMOrg and that? Well, we have BLM Special Agent Dan Love, the head of security for the Federales at Burning Man, leading from the front lines in the Bundy Ranch stand-off with Cliven and his family. Harry Reid was forced to back down when his family connections to a Chinese solar plant planned in the area were exposed. Recently, though, the Bundy family got caught up in another stand-off with the BLM in Oregon at the Malheur Wildlife Refuge – this one linked to Uranium, the Clintons, and the Russians. It turned fatal when the Feds assassinated a patriot Lavoy Finicum before he could meet with a local Sheriff, Cliven turned himself in for arrest and is locked up without bail in Federal prison awaiting trial. About a week ago the BLM announced they were resuming their operations on the land. Then we have Love again as the alleged main instigator of ChocoTacoGate. BMOrg pulled some big strings, bringing in former Senate Majority Leader Harry Reid in what the Washington Post called “a trippy alliance”. They hired Reid’s hand-picked former head of the BLM Bob Abbey to help smooth the waters with the many Government Agencies involved in Burning Man. Long-time BLM official Gene Seidlitz was moved out of the way. BMOrg fought the law, and BMOrg won. I also noted last year the last-minute decision of the BLM to not allow access over one of their roads to Further Future 1. That land was also involved in a BLM land grab dispute, related to a nearby mine. From what I gather, there is a very large new gold mine quite close to Black Rock City and the Fly Ranch site. Let’s recall too the ditching of local EMS provider Humboldt, for big commercial festival provider CrowdRX. Looks like they were in the right county for Burning Man (Humboldt), but the wrong one for the Burning Man Project (Washoe). My gut instinct tells me, something big is afoot. Are we headed for the ultimate version of Brexit: the BURNEXIT? When the tech industry all vanish off the face of the map, and move to tax havens in the desert where they can take LSD every day for weeks to “increase productivity”? Look Out for The Judge! …Mike Judge, that is. If you haven’t seen his new show Silicon Valley check it out, it’s hilarious. The show brilliantly skewers Silicon Valley and the Bay Area hipster/tech culture, while also giving you characters you can care about and a story you can get behind. After Billionaire Burner Elon Musk told Judge he had to go to Burning Man, because “Burning Man is Silicon Valley”, the two made peace – Judge featured Burning Man posters on the walls of the “work/live space” that the show is set in. Like me, Elon is giving Caravansary a miss. There’s good news, though, fellow Burners: Tech Crunch is reporting that part of Season 2 may see Pied Piper heading out to the Playa. I would love to see the Beavis and Butthead and Idiocracy creator’s take on Burning Man from the viewpoint of its lovably awkward startup geeks. I wonder if there will be sherpas and shark-jumping? Mike Judge has never been to Burning Man, but that could change this year. We hear the HBO Silicon Valley creator may be going to do some research on what many believe is an essential experience for Silicon Valley insiders. We hear Musk will not be attending this year. However, Judge might be among the technorati attending the annual festival in the desert now. What Musk said about the show could be the inspiration for a possible Silicon Valley episode as well. After winning TechCrunch’s Disrupt Battlefield, Pied Piper is probably ready to raise its Series A Round. That’s a process that could lead the founders to the playa, which is increasingly becoming a place where deals like that get done. Burning Man is now rife with tech billionaires and young startups alike. There have been reports of actual business meetings (clothing optional?) being conducted out in the desert in year’s past. Here’s to hoping Dinesh Chugtai gets his freak on in a cloud of playa dust this next season. Well you know Erlich will be. That dude was born to burn.